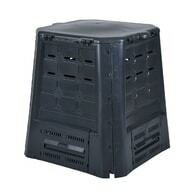 Garden composter for biological waste, leaves and grass. Ideal for preparing high-quality compost. Capacity 360 litres. Garden composter for biological waste, leaves and grass. Ideal for preparing high-quality compost. Capacity 600 litres.